Did the trunk of that vehicle look like a hive or have a particular smell? Thanks for posting this. I wonder why they were there. I hope the people called you or were able to take car of the "problem" without hurting anyone. Wish all the news stories were as entertaining as that one. considers Critcal Mass to be a bona fide form of religious expression. its holy days is in fact named "Bicycle Day". the URL for Matrixism is: http://www.geocities.com/matrixism2069 . pass this info along to anyone that you think may find it interesting. Just when you thought there couldn't be any more controversy (haha), a blogger at the East Bay Express hints at yet another conspiracy theory: this time, it isn't the critical massers whose puppet strings are being pulled in a grand plan to terrorize the elderly and hoist their car up to crush their own expensive bicycles, no, this time bees are being deliberately placed in strategic locations! Is it true? Hrm. Worthy of further investigation. Just for those in the dark, Boalt Hall is the School of Law at UC Berkeley, considered an ivy tier law school and generally progressive and more likely to support public interest work than most (which ain't sayin' much). 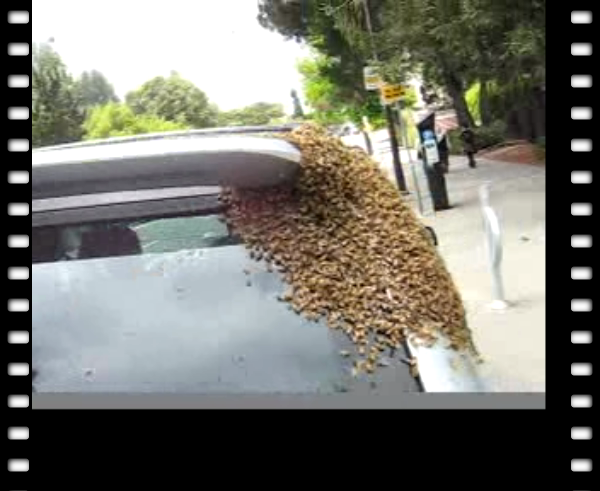 That's so funny that the bees were in front of Boalt, right at the entrance. Truly prescient.